It's been some time since I have made homemade jelly. I think one of the reasons that I haven't is because in the past the process, of jelly making and canning, always seemed to happen during the hottest days of summer. Well, it just so happens the the fruits and vegetables all seem to ripen at that time of summer. When jars need to be sterilized in large pots of boiling water and the cooking of the fruits and veggies are coming to rolling boils with steam rising near the stove, it's a "HOT" process for a hot summer day. 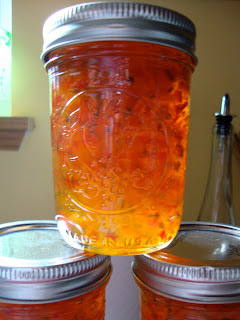 Trying to use the abundant supply of peppers from our sons garden, I wanted to attempt making some "sweet and hot pepper" jelly. We discovered a great variety at Whole Foods, made by a local woman. It makes a great appetizer with cream cheese and crackers. We enjoy it so much that with the supply of peppers we have access to, I thought why not make my own and then use it as holiday gifts for friends and neighbors. The first batch turned out very well, but not quite "HOT" enough for our taste. The next batch will need an adjustment of jalapeno peppers. Still yummy! yellow and even purple peppers was minced up. Then the hot ones were added. The recipe called for 10 jalapeno peppers. I adjusted this first batch using only 3, for the next batch I'll use 5. Once it's all cooked and boiled it will fill 6 - 1 cup jelly jars. NUMMY! This looks so good and tastes even better during the winter months. (Here in IA anyway :) I'm waiting for some more green peppers to make some spaghetti sauce! Where Are The Days Going?